Sitting down to dinner is an opportunity to catch up, slow down and spend quality time with one another. And even when you can’t all sit down at the same time, there’s something to be said for coming home to a healthy, delicious meal. So why does dinner often feel so hectic? What you really want is a way to end dinnertime stress so you can enjoy family meals more often, right? We all agree making dinner at home is better than another trip through the drive-through or call to the pizza place, but what are some ways you can streamline meal planning and preparation to make it easier? Listed below are 5 simple strategies to conquer dinnertime and make it a simple, stress-free moment with your family. Try just a couple to start out and see if it makes life easier! Shop once a week for all your groceries. This is a BIG time saver. Compile your grocery list and try to only shop once a week. Stop cutting and saving coupons you never use. Read our tips for saving money at the grocery store, without the hassle of coupons here. Consider grocery delivery or curbside pickup through your store. Grocery delivery and curbside pickup are becoming available throughout the country and once you try it, you might just find the hours this saves you in shopping and driving to and from the store will be the thing you need to keep you on track. One way to remove end dinnertime stress is to do what you can ahead of time. This doesn’t mean you need to reserve hours of time on the weekend. But consider making any marinades sauces you might need for the week, or chopping some veggies the night before or in the am while the kids eat their breakfast. Even gathering all the ingredients for tonight’s dinner from your pantry in the morning will save some time in the evening. Stress occurs when you don’t provide yourself enough flexibility. If you’re going to have a busy week, make extra servings and plan a leftovers night, so you only have to “cook” 2-3 nights a week. Meal planning won’t be successful if it feels like a burden. Keep the basics stocked in your fridge and pantry so you can whip up “Breakfast for Dinner” or a simple pasta dish if you’ve got a craving for something else or are just completely short on time. We all have those dinners we make when “we don’t have time for dinner” and having those ingredients at the ready can get you through the chaos. By involving your family, you’re keeping them busy. Instead of complaining about when dinner will be ready, they can pitch in to get it on the table. Simple jobs such as setting the table or putting the lettuce in a bowl for a salad can be completed by even the least experienced chefs. At The Dinner Daily, we hear lots of feedback from members about how involved their family has gotten in cooking dinner and how it has created some nice moments with their kids, as well as reduced the work load. Start by creating a meal plan that is realistic. Let’s be honest, most of us can’t set aside an hour plus each night for cooking and preparing dinner. Consider how much time you really have available each night and base your meal plan on realistic expectations. Choose at least two recipes a week that can be made in 30 minutes or less. Another way to simplify things is to use recipes that can be made in a slow cooker or one pot. Less prep, less cleanup. 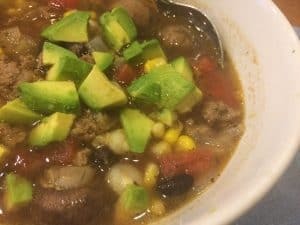 This recipe for Mexican Beef Stew takes just minutes and is a perfect “make ahead” meal. And most kids love it! Finally, once you’ve found a quick recipe that the whole family enjoys, save it and build it into your rotation of meals you know you can make in 30 minutes or less. Considering Using a Meal Planning Service? At The Dinner Daily, we streamline mealtime by creating a personalized menu plan and shopping list just for you, based on your food preferences and the sales at your grocery store. Signing up for a meal planning service is a great way to outsource end dinnertime stress: for less than a cup of coffee your weeknights can be organized with weeknight meal plans, a ready to go shopping list and you can actually save money. We’d like you to give it a try – for free! You can sign up for a two-week trial here, or simply download a copy of our Weeknight Survival Guide, which includes 5 delicious dinner recipes and a complete shopping list.